There is nothing that says fall in Michigan like a cold, juicy apple on a crisp autumn day. And (in my opinion) no better place to enjoy this special treat than right here in Michigan. 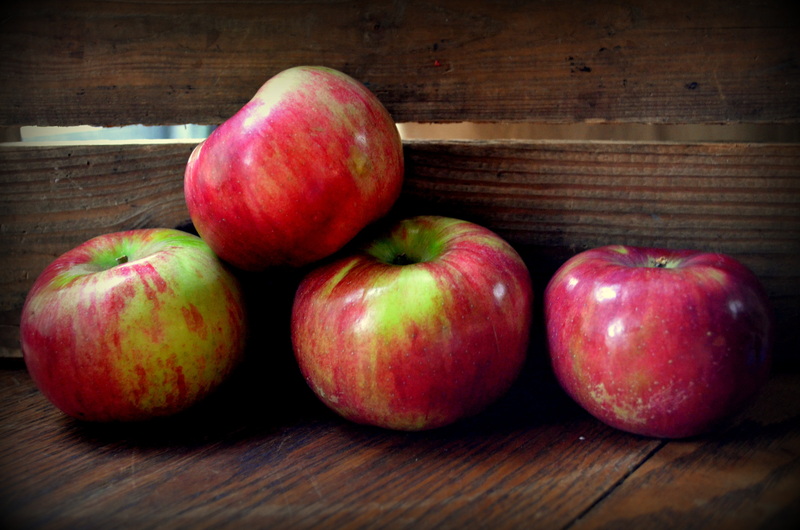 Michigan apples have a flavor that is out of this world. The comparison between a store-bought apple and an apple fresh from the orchards is like comparing store-bought tomatoes to one picked off your own tomato vine. Just one bite and you are transported immediately to the gnarly tree it came from. Eating apples this time of year makes me feel so grateful for fall. Fall is one last hurrah. A punctuation mark on summer. And in Michigan, that punctuation mark isn’t any old period. It is an exclamation point. We are fortunate to live in an area of the country that abounds with apple orchards. Just yesterday we drove up to the Sparta area, a bit north of Grand Rapids, and checked out a couple of apple orchards. It was a cloudy day with patches of rain but when we made it out to the orchards, the sun had peeked through and it lit up the landscape. Suddenly the reds on the trees were flaming, the pumpkins were bright orange orbs, the apples shone red-purple, and the rolling fields of dried corn stalks glowed golden under a deep blue sky. My sweetie often jokes during his performances that Michigan apples are the only apples that have the all the vitamins and nutrients a body needs. If you’re eating apples from anywhere else, you’re missing out. He grew up picking apples with his whole family when the times were tough. His dad would climb to the top of the tree, his mom would handle the middle, and he and his siblings would pick up the “drops”, the apples on the ground under the tree that are used to make apple cider. True story. When I say cider, I’m talking about the real deal. The kind that can only be found this time of year, freshly pressed, cloudy, sweet and tart. This time of year, almost any gathering you go to offers cups of hot cider for guests. It can be a special treat but I’m not the biggest fan of drinking hot beverages beyond coffee and tea. But how could I walk past those gallons of apple cider? Well…I couldn’t…so I had to figure out something to do with it. I came across an idea for an apple cider reduction. And I am so glad I did. All it takes is a big, heavy pot and some patience. You basically just boil the cider down until it is 1/4 of the original volume. I boiled 8 cups down to 2 cups over about an hour or so. This reduction can be used in a myriad of ways. You can make a vinaigrette with it (mix with olive oil, a splash of white balsamic vinegar, a dash of salt and pepper) or brush meat with it if you desire. And if you really want to go all out, keep boiling the cider down from 8 cups to about 1 cup and you’ll get an even sweeter reduction, just begging to be poured on ice cream. And with that I present to you one of the easiest desserts I’ve made, roasted apples with vanilla bean ice cream, walnuts, and a cider reduction sauce. 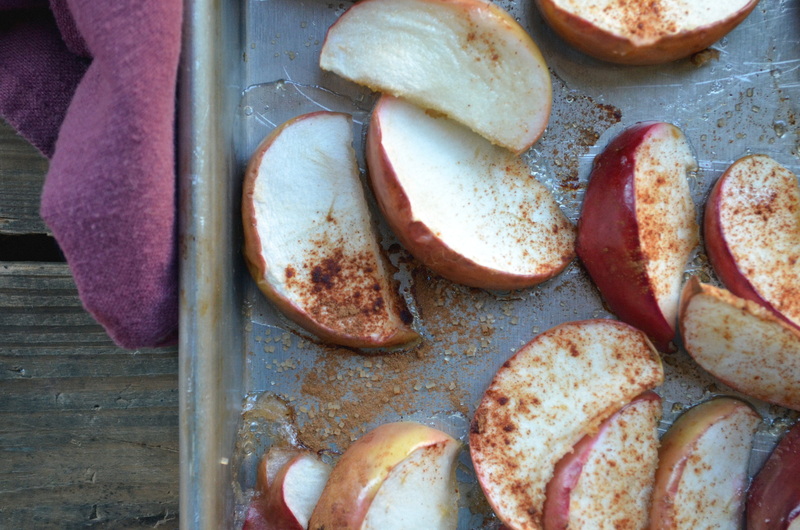 For this, choose apples that will hold their shape in the oven. I chose Cortland apples but Fuji, Jonathon, or Honey Crisp are all good choices. This dessert is so simple yet such a delicious way to enjoy the season’s best offerings. If you are looking for other apple recipes, head over to Cooking Light–they have dozens of apple recipes, with some of the best here. The apple upside-down cake looks amazing. I’m planning to use some leftover roasted apples to make apple muffins with cream cheese frosting. This recipe looks like a good place to start my brainstorming! 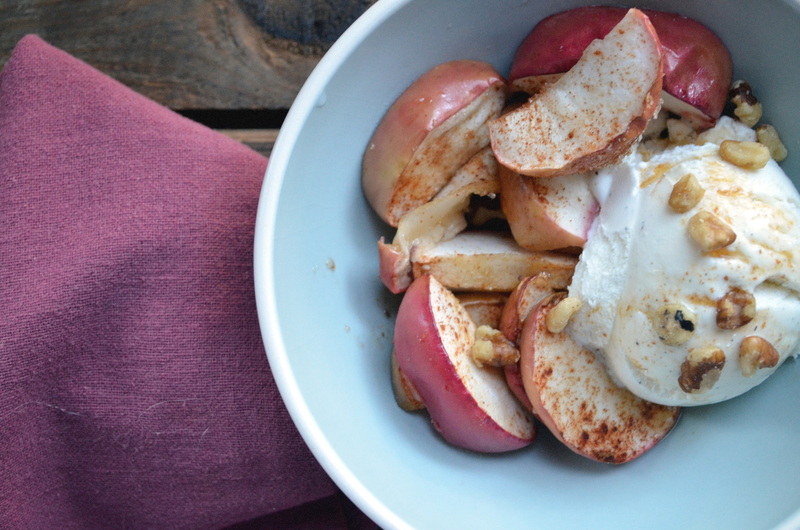 But for now, here is my simply delicious roasted apple recipe. Make the apple cider sauce ahead of time (see below). Pre-heat the oven to 350°. 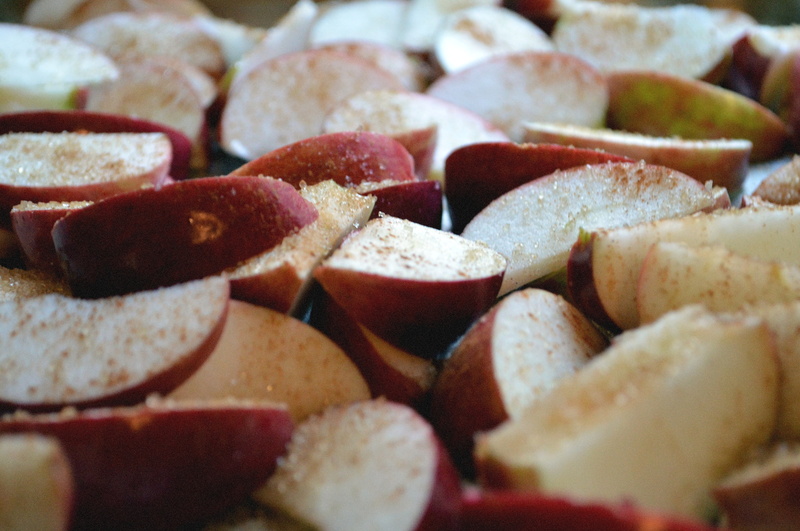 Spread the apple slices onto a large baking sheet and sprinkle with cinnamon and sugar. Roast for 15-20 minutes, until soft but still maintaining their shape. Go too far and you’ll have apple sauce wedges (which would still taste good so no worries!). 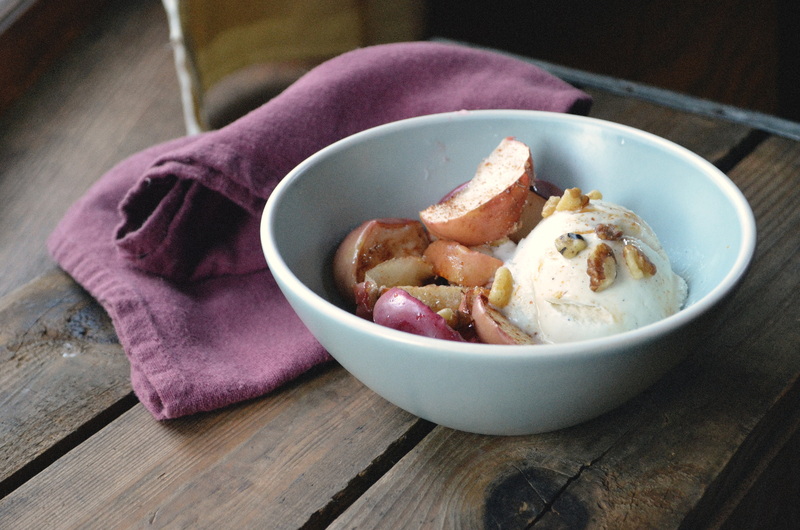 Scoop apple wedges into four bowls. Add 1/2 cup scoops of ice cream to the top, sprinkle with 1 tablespoon walnuts, and drizzle 1 tablespoon cider sauce on top of it all. Dig in! 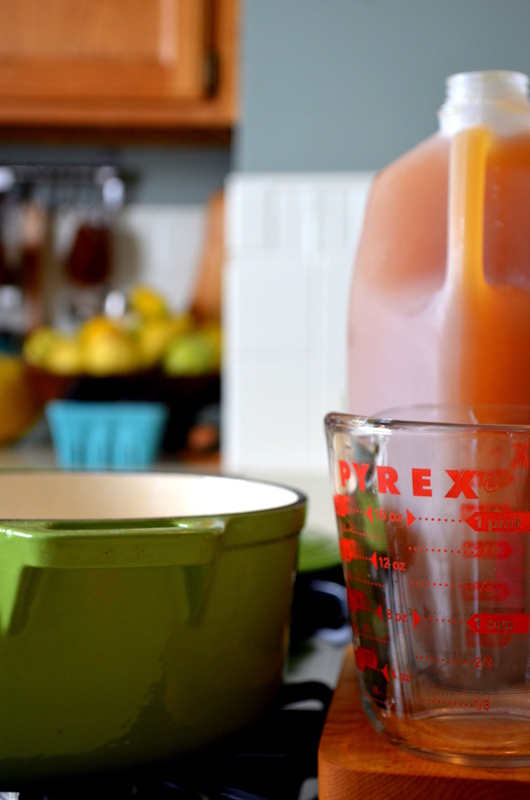 Make the cider sauce ahead of time (you can make this up to a month ahead!). 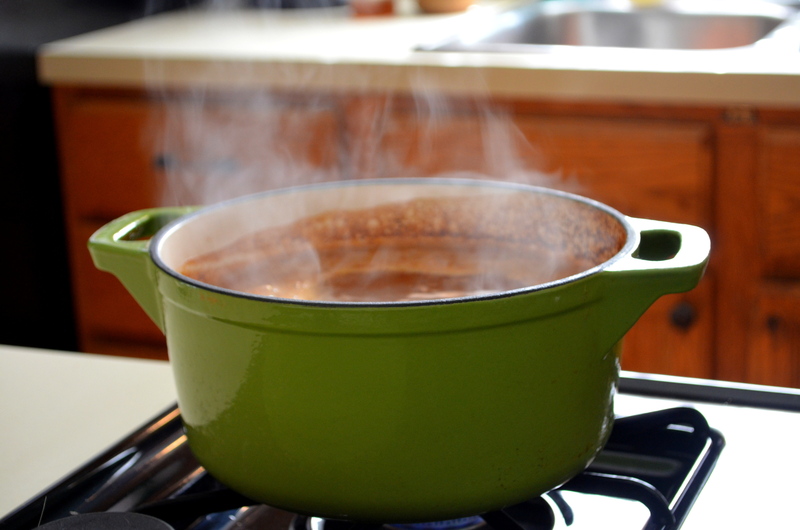 Pour apple cider into a large, heavy saucepan or Dutch oven. Bring to a boil, then turn heat down to low to simmer for at least an hour and up to two hours until the apple cider is reduced from 8 cups to 2. You can keep this sauce in the fridge for a month and in the freezer for up to 6 months. To make the sauce even more condense, you can boil it down further until you have about 1 cup left from the original 8 cups. You’ll use just a bit for this recipe and can store the rest to use in a variety of dishes. Oh . . . this hits all the right notes for me. I absolutely love apples and the fall harvest makes me so happy. Plus, vanilla bean is one of my favorite flavors. What a wonderful treat! Thanks for the comment, Shannon! I hear ya–fall and apples make me a happy gal. I only just discovered your blog last week and already I’m totally in love with it! The apple cider sauce sounds amazing and I’m really keen to try it, but I have a quick question. I live in Cape Town South Africa and apple cider is not something people are really into here. So my question is, is apple cider different from apple juice? And if so, do you think a reduction of apple juice would work the same as an apple cider reduction? Natashia, apple cider and apple juice are different in that apple cider is raw juice that is not filtered so there are teeny bits of apple left behind. Apple juice is filtered and clear. Apple cider just tastes so juicy and fresh and especially here in Michigan, where we have apple orchards everywhere, it is a special treat in the autumn. A lot of people heat it up and serve it hot, some add spices to it, and some add rum!